Audi is to build a coupe-SUV called the Q8, with production from 2018. The new car will share its underpinnings with the Q7, but with sportier, coupe-like styling to rival the BMW X6 and Mercedes-Benz GLE Coupe. Prices will be confirmed later, but should start at around £55,000. 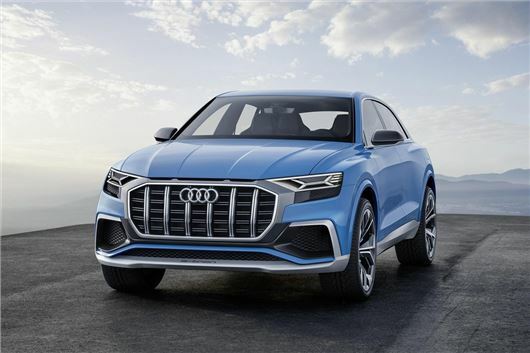 Audi has revealed a concept version of the car at the 2017 Detroit Motor Show, but while it is billed as a concept Audi has confidently described it as "near-production" so expect the production car to look very similar inside and out, but with a few less fanciful flourishes. The show car uses a plug-in hybrid powertrain, using a 3.0-litre petrol engine and a single electric motor, providing peak power of 442PS and peak torque of 700Nm. Official economy is 122mpg and emissions are 53g/km, with a pure electric range of 37 miles and a charging time of around two and a half hours. Transmission is an eight-speed auto. A plug-in hybrid is very likely to be offered in the production car and, since the Q8 shares so much with the Q7, buyers can expect the same also expect 3.0-litre and 4.0-litre TDI diesels like those available Audi's current flagship SUV. Buyers can also expect the latest safety technologies including autonomous emergency braking and semi-autonomous driving for motorways, which will match the speed of the car in front, steer to keep the car in its lane and stop automatically in a jam. The Q8 has a less aggressive roofline slope than its Mercedes-Benz and BMW rivals, the advantage of which is more generous rear head room and less impact on boot space, which in the concept is 630 litres. The cabin features several touchscreen interfaces - meaning we could see Audi move away from its current rotary control system soon. The concept also features a novel head-up display inspired by augmented-reality technology. It can, for example, project an arrow in the driver's field of vision so that it appears like an arrow would if painted on the road - although a more traditional HUD is more likely in a the production car.